TASK: Assess suitability of alien cultures for assimilation. 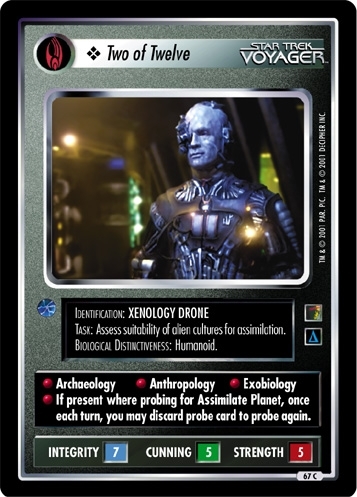 If present where probing for Assimilate Planet, once each turn, you may discard probe card to probe again. There are 13 entries for Two of Twelve (ST1E 13 C 67) at the Tradeplace (52 haves and 0 wants). Click here to see all trade list entries for this Common card!